so a year long I will have wasabi !!! 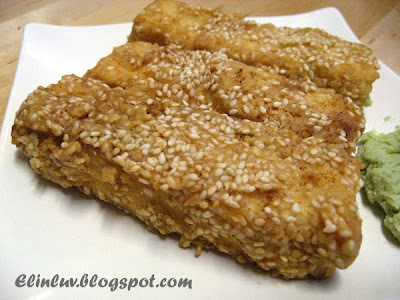 with crispy powder and sesame.........mouth-watering goodness ! Dust the tofu nuggets with potato flour/ crispy flour , dip in the egg white and coat with the coating flour mixture. 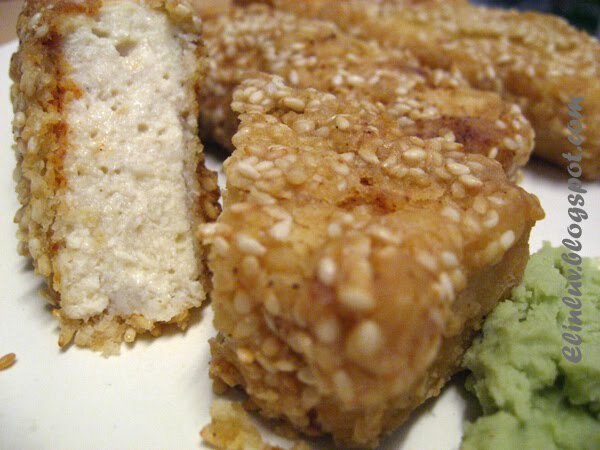 Place the coated tofu into the hot grapeseed oil in a non-stick pan , far apart so that they don't stick together. Pan fry them under medium heat. Flip over the other side when it is slightly golden in color. Dish up and place them in paper towel to absorb the extra oil from the tofu. Serve with wasabi or any hot chilli dips of your choice. I love it! Guilt-free too. ok 1stly, buy grapeseed oil.. now getting "younger" and cholesterol is lurking somewhere near.. better take care now..
these nuggets sure are different.. got sesame seeds ones! i can imagine the taste.. yes! This looks really crunchy and delicious! 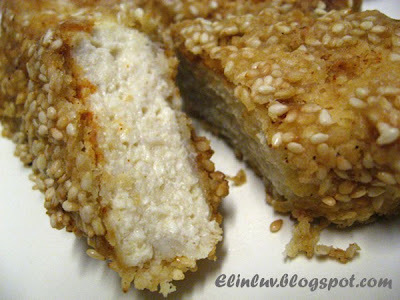 Great looking tofu nuggets. Can you deep fry with grapeseed oil? 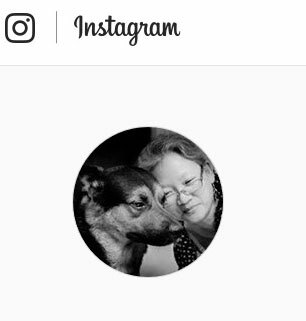 What brand do you use, from JJ? These look almost like cheese nuggets. :-) Gorgeous! never use potato flour for deep frying, so use this flour more crispy right, must buy some.. Ooo...I bet these smell delicious! Don't forget to feed Claire with these huh! hehe.... Hope you're having a wonderful day. 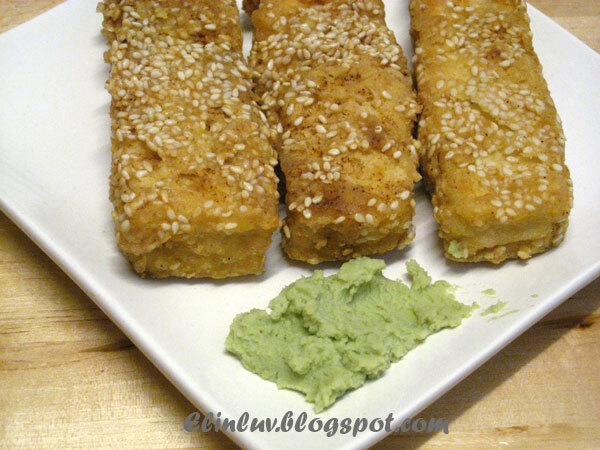 I love deep fried tofu! esp with chili sauce. I like how you added sesame seeds! This looks like a great snack. We lived in Singapore for a couple of years and my husband did a wonderful drawing of the beautiful mosque in Ipoh. Cheah....thanks...yes you can use the oil for pan frying under medium heat. The grapeseed oil is 'Goccia Doro ' from Italy and 1 litre bottle costs RM21. I bought from one of the wholesaler in Pasir Puteh. Can't remember the shop name coz a colleague took me there. Will find out the shop name for you. Jusco sells grapeseed oil too but not Tesco. Olive oil is for salad and stir fry but extra virgin oil, you cannot even stir fry...it will lose its properties. Grapeseed is good for our daily stir fry. No cholesterol. 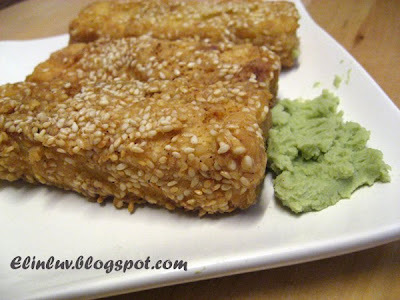 Anh...:) do try it out and I am sure you will love making your own tofu. Wow homemade tofu. I can't even imagine tryig to make this. The cripsy nuggets bit definitely caught my eye. Yummy! These look better than any chicken nuggets I've ever seen. I've never had tofu nuggets but I'm very curious, thanks for sharing. After seeing this I was inspired to do something similar when I had an extra square of fresh tofu (bought). 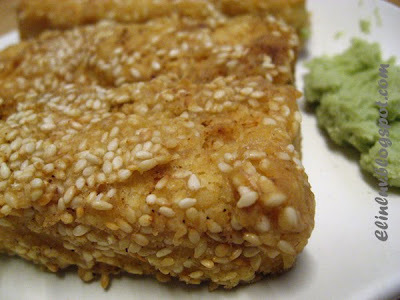 I sprinkled some cornflour with some 5-spice and just used that to coat my tofu fingers before frying gently in oil. They didn't brown easily so I carried on cooking. Result? A very crispy exterior! I think it would be a good way of preparing tofu cubes if you wanted to make a sweet and sour tofu for vegetarians!